The story of what happened when a sheep guard dog attacked a mountain bike rider in Colorado. A woman who was attacked by sheep guard dogs took her case to court and won. This is another one of those “last of the Old West” stories. I’ve been reading them most of my life, so I don’t think that the so-called “Old West” is disappearing at all. These stories are just used evoke sympathy for the livestock industry. Perhaps organizers of the event deserve blame for allowing the participant to continue so late in the race. Agency staff should have been on the site to assure event conditions were met. Then again, how well do they monitor grazing permits either? The race organizers fell down on the job, they should have notified the lease holder that there was a public race being held and he would have taken steps to prevent a situation from happening. I feel very sorry for the person bit and I feel sorry for the rancher who was executing his lease. What I have here is no sympathy for either side. Just as ranchers shouldn’t expect risk free grazing on public lands, so should recreationists not expect risk free fun on public lands. In this case, the biker is just a whiney city slicker who was in the wrong place at the wrong time. You know, I went into this having a little sympathy for the rancher. A lot for the lady, but a little for the rancher. After reading the article, though, I realize this is just another guy who thinks that his lease makes him the great baron of public land. “The recreation industry,” he said, “produces smiles and giggles but not much else.” A couple of pretty valuable commodities in my opinion. Excuse those folks for using THEIR PUBLIC lands! If your dogs attack someone you are responsible; doesn’t matter if it’s in the woods or in downtown Aspen. And you don’t own the land, fella; you’re only using it. The recreation industry (hunting, fishing, camping, biking, etc.) vs. sheep production… I wonder which one brings more revenue in? Hmmmm, that’s a tough one…I’d venture to guess just one segment–let’s say, mountain biking–brings more money to Colorado than the wooly mountain maggots do. And guess what Alan, She was only using it and both were using it legally…..who is to blame? Both sides and the biggest blame should go to the organizers of the event, that lead the public to believe nothing could happen and didn’t tell the rancher what was going to happen..
Folks this is a two way street, yes it will change in the future, but right now, both sides need to acknowledge and know what the hell is going on! The blame, if any, lies with the Forest Service. As someone who looks at sheep grazing plans every year, I must say they look like football play diagrams and are hard to decipher…and sometimes not followed. I don’t think the mtn bike race sponsor should be expected to research where the sheep are; it’s the Forest Service’s responsibilty. Moreover, in high use recreation areas, these should be considered as no longer “suitable” for grazing and closed if the potential for public endangerment exists. I have heard a number of complaints about aggressive sheep guard dogs, including from a horsewoman who was bucked off her horse, and have experienced this scary situation of aggressive large dogs on several occasions personally. It has been a high use area for many years now, but it has been a grazing area for many years now, so all of a sudden, we switch gears and cut them off? I tell you what, I am 100% behind getting livestock off public lands, but there has to be a reasonable solution here, you can’t just throw generations off the land, it takes education and understanding on BOTH sides of these issues, and unfortunately there seems to be little understanding on either side! I’m no apologist for prissy mountain bikers; but, domestic sheep are just flat awful. With their thin lips and protruding teeth, they eat the grass down into the root crowns and damage the range more in a month than cattle do in a year; they carry every disease from mites and pneumonia that attack wild bighorns to scrapie prions that spread to deer and elk to cause CWD and to cattle to cause mad cow and then vCJD; and they are literally predator magnets, which is why sheepherders have to insist on killing every predator for miles around just to get a decent lamb crop. Wildlife Services, sardonic alias if there ever was one, just loves sheep and sheepherders. And you really need to meet one of those multi-generational sheepherders. Oh, they’re real elegant people all right! The questions of public versus private land and pro / cons of sheep aside, I´m torn a little bit what to think about this article. Here in Europe we encourage sheep owners to deploy dogs, provide even financial assistance and the results are generally quite encouraging. I know that e.g. in the Pyrenees and in Switzerland a leaflet is available for hikers and bikers “how to behave when encountering a guarding-dog (a “Pastou”). Much the same as a “Hiking in bear country” leaflet I once received somewhere in the Southwest USA. One of the main rules to prevent a dog from misinterpreting your movement as a “potential attack” is “to keep your distance” another rule is “If you are a cyclist, dismount and detour”. From what I get from the article, it seems the dogs just have done what they are supposed to do: protect the flock from what they identified as “imminent attack”. On the other hand, a survey conducted 2007 in Switzerland, where currently about 70 dogs are employed, revealed that about 60% of hikers and mountainbikers are not familiar how to act when meeting a guarding dog. But, most of those interviewed would be willing to adapt their hiking/biking habits, accepted the return of the large carnivores (in this case wolves) and the related deployment of guardian dogs. Yes, they were both using the forest legally. But if we are in town and you are walking your dog and I am riding my bike, and your dog bites me, who is at fault? If we are both hiking, you with your dog and I by myself, and your dog bites me, who is at fault? Once again we are both engaged in perfectly legal activities. What if your dog bites the mailman (let’s say for sake of arguement that you are leasing your home and do not own the property, though legally it would not matter), or if your dog bites a neighbor child? No difference here. This man was convicted of having dangerous dogs. There is no question who is legally responsible. It certainly isn’t the Forest Service, that’s ludicrous! This wasn’t a bear feeding on a carcass in the area. These weren’t even wild animals, though even if they were, I would argue that it is not the Forest Service responsibility to babysit every visitor. These were privately owned and presumably trained animals. Trained, apparently, to attack. With that, in a modern, civilized world, goes responsibility. Period. This is very old problem. In 1896 John Muir went into the Sierra Nevada with sheep herders and two thousand and fifty sheep. His observations in his book “My First Summer in the Sierra” about sheep, sheepherders and tourists are precious and as true today as they were then. His opinion of sheep were well written and I have to say humorous sometimes. His bear encounter was also very interesting. The poor woman attacked by the dogs should have had her pepper spray. There, I suppose I stepped in it big time . . but I carry pepper spray on my mountain bike and so far used it on a dog, bees and never even uncapped it for a bear, wolf or mountain lion all of which seem relatively well behaved compared to humans, their dogs and mad bees. Well put, Linda. She should have indeed blasted these dogs with pepper spray. She should also have dismounted as soon as she detected the dogs (chances are they were barking before they attacked). But none of this changes who is legally at fault. You are responsible for the actions of your dogs just as you are for the actions of your children. The only privately owned animal that is exempt ,of course, is the all mighty cow when it tramples through my flower garden. Then it is my fault for not having a fence capable of keeping it out! Go figure. Yes they were trained to attack, that is the purpose of a sheep protection dog, they attack perceived threats to the flock. I would say, this rancher, although on public land(which I am against) is trying to stay with the times and keep from killing predators as the only option. We have seen time and time again, public land ranchers who don’t practice any type of protection for their livestock. Usually the organizer of an event on NF land has to provide all kinds of proof that the event will be properly supervised and safe. That and assuring no resource damage will occur are the main FS concerns. Event sponsors usually must be bonded and provide proof of insurance. That’s why it’s often difficult to get a special use permit for these kinds of events. The injured rider probably sued the dog owner because she felt he was primarily responsible but she also wanted vengence. The event organizers were lucky to avoid damages and you can bet the FS people involved will do better next time. They had two overlapping permitted activities and they apparently didn’t see the possible conflict. Yes, I favor “throwing” sheep permittees off public lands. A grazing permit on federal land is a privilege, not a property right. Domestic sheep on these allotments create a myriad of problems, such as resource damage because the sheep are run in such large numbers, losses to taxpayers from the minimal pennies per head grazing fees, passing on disease to wild bighorns, cause the kinds of recreationalist conflicts we’re discussing here, etc. For permittees willing to voluntarily waive their permits, I do favor some type of buyout arrangements similar to what was done with tobacco farmers in the south. That would give these guys some transition money to revamp operations or train for new careers or whatever. Just as a matter of pragmatism, not sympathy. 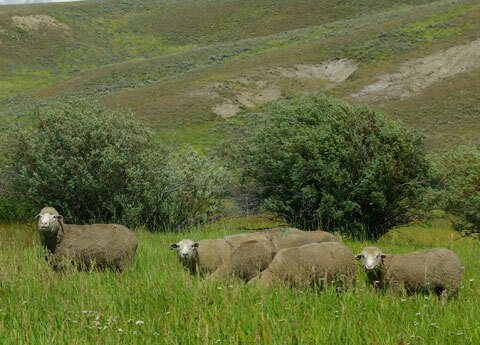 The fact that they or their grandpappies may have been running sheep for decades or generations on public lands doesn’t give them special rights. People are adaptable, wildlife and wild places are irreplaceable. There in is the problem..You explained it very well…and you explained very well, why there will never be a solution to the situation that now exists in the West..
Just to add, as I said before, there is little understanding on either side of these issues now a days, and I am sorry to say, I will not live long enough to actually see the solution….but I expect, I will see many more battles before it is all solved..
You are right Save, the dogs were trained to protect the herd; but if I have a dog that I have trained to protect my home and my family and it mauls someone who is not attacking them, I am legally responsible. You are right , there is plenty of blame to go around; but only one person is legally responsible here. That was upheld in a court of law, as it should have been. BTW, it is possible to train dogs to defend a herd against predators but not to attack people. If you are going to allow them to run loose on public land, that is what you need to do. The dog was apart of the livestock operation, what if a bull or cow charged the biker and injured her with similar injuries would it still be criminal. These are work animals and permitted under the term of the lease. The permit holder has a grazing lease giving them a legal leasehold interest in the property for the term of the lease. I do not think that the sheep owner should be held criminal with work animals. I have seem these dogs with sheep on the public domain and I have seem signs warning the public about the dangers of these dogs. It is the organizers of the race who are responsible. South of Bozeman their is a mountain bike, horseback and hiking trail called Sourdough Trail which is very popular for the after work crowd. I love the 5 mile ride up to the bridge, stop for a few minutes hear the grouse drum, drink some water and watch the dippers in the stream catching dinner. Then it full bore downhill for 5 miles — great fun. I would not ride my horse on that trail nor do I think anyone should, but it is a multiple use trail. Several years ago I was told that a mountain biker never stopped or slowed when approaching a horse. The horse kicked him in the head and he lost an eye. Should the horseman be held liable for the injury or if the horse had buck and injured the rider should the mountain bike rider been held criminal liable. There is some common sense. When I am riding and I approach a horse I slow way down and let the rider and horse know that I am there and proceed under the instructions of the rider. Someone mentioned that sheep were “wooly maggots”. I think that a mountain bike race on public land is a race of “two wheel maggots” public land are not for mountain bike races. Mountain bikes — I love them and hate them. Solution, Save Bears, is for the government to stop subsidizing sheep operations. Without wool, meat, and pelt subsidies, cheap federal grazing fees, and the visa loophole allowing minimal wages and indentured servant conditions for foreign sheepherders, the typical western public lands sheep permittees could not survive under free market conditions. Why are sheep businesses so sacred to you? Also, Elk 275, the permittees don’t have a “leasehold” legal interest for the term of their permits. Read the federal court cases on grazing permits, they are a privilege revokable at the will of the sovereign. No amount of hot air from the uninformed will change the legal standing of permittees. Within the last several years, I have seen Merino wool underwear, soxs, shirts, hat and other assessories become more and more available. Beth, the manager at the Dillion Patigonia outlet gave me a Merino wool zip up that was well beyond a second maybe a third or fourth. That was the best thing she ever did. I hate Capiline, poly pro and other material made out of recycled plastic bottles. When it wears out it is gone and I will only wear Merino wool. Yes, I know that Merino wool comes from New Zealand but it comes from sheep and lamb chops and leg of lamb is my favorite meat. I do not think that sheep should be grazing on national forest lands and most BLM lands. But wool and lamb have to come from some place. Maybe one day it will only come from New Zealand, I hope not as I try to buy American lamb. Have you read any thing I have posted, I fight every day of the year, to put an end to public lands grazing, I did before I worked for Montana Fish Wildlife and Parks and I have continued since I worked for FWP. I am simply saying, you can’t just pull the ground out from under neath of these people and expect to come up with a solution, because you won’t have a solution at all, you will have a WAR, which unfortunately is what is developing in the west. Ask someone to do something and most likely they will, tell them they are going to do it and you will end up with a fight. Debra, as a wildlife biologist, that was heavily involved in working with lease holders over issues concerning free ranging bison, I can tell you, I am not the uniformed, I am very well versed in the legalities of leases as well as the social ramifications of lease holders and public interests. I forgot to add, the sheep business is not sacred to me, as I said, I am against public lands grazing. I am compassionate to BOTH sides and want to find a solution that works with the least amount of friction, but when I hear the extreme positions on both sides, I fear that we will never have a workable situation on anything! Save Bears: Getting cows and especially domestic sheep off public lands is a NO BRAINER. Ranchers have been destroyed so much already. Enough of the middle ground. Ranchers never give an inch. THAT much we know. So there is no middle ground to be had. Kt, spoke to me, go figure! Just to add, neither side at this point in time, gives an inch and want to take a mile, BOTH SIDES! ” neither side gives an inch and wants to take a mile, both sides. Sounds really familiar, different subject but familiar to another one. As a person that both works for the USFS and obtains permits for public events on Forest Service land, I feel that I might know a bit about this. First — either the USFS screwed up by not knowing where/when the permitted event was taking place — OR — the people putting on the event didn’t do their homework. When we put on an event, we need detailed maps (gps readings, usually aerial photographs, etc), a million dollar insurance policy naming the Forest Service as a co-insured, appropriate signage, etc., etc., etc., ad nauseum. The Forest Service, in our particular National Forest, checks that every “i” is dotted and every “t” crossed. It takes MONTHS to get an approval and the permit is subject to being revoked up until the last minute. We have to have insurance statements from any vendor that might participate – sporting goods dealers, even the food vendor(s), even though they are nowhere near the course. This incident was plainly and simply the result of one of the two (FS or event sponsor) not doing their due diligence! !